Chinese mobile maker Xiaomi has launched its new smartphone Mi 6X. This phone will soon come in the name of Mi A2 in the Indian market. Xiaomi Me 6X cameras come with AI integration and it has been given a custom skin based on the Android 8.1 OREO. This handset is likely to be launched in the Indian market soon because Xiaomi Mi A1 has been out of stock in India. The most expensive variants of Shaomi Me 6X will be sold for around Rs 21,000. This Powerful Variant will come with 128 GB of storage with 6 GB RAM. Sales of this phone in China will begin on May 27, 2018. The price of 4 GB RAM and 64 GB storage variant is 1,799 Chinese yuan (around 19,000 rupees). Variants with 4 GB RAM and 32 GB storage will get 1,599 Chinese yuan (about Rs 16,900). The new Xiaomi Mi 6X has a 5.99 inch 18:9 aspect ratio display. It is equipped with a thin border. The smartphone will be available in Red, Gold, Rose Gold, Blue, and Black colors. There is a dual rear camera setup in the handset. On the previous part, the primary Sony IMX 486 sensor of 12 megapixels with F/1.75 aperture. The second is the 20-megapixel Sony iMax 376 sensors. Rear camera setup is equipped with phase detection autofocus and dual-tone LED flash. For the better color in photo and portrait mode, AI Scene Recognition Technique has been used in the rear and front camera. The handset also has a Face Unlock feature with a fingerprint sensor. Dual SIM smartphone will run on the MUI 9.5 software based on the Android 8.1 Orao. The octa-core Snapdragon 660 processor has been used in the handset. The highest clock speed is 2.2 GHz. As we have already told you that the user has the option to choose between up to 6 GB RAM and 128 GB of storage. The most important feature of this smartphone is cameras that come with AI integration for better photography. 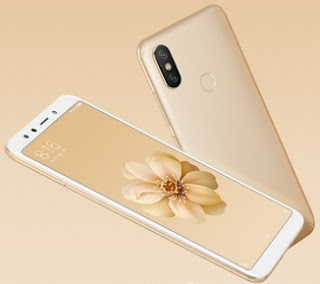 Xiaomi Mi 6X / Xiaomi Mi A2’s selfie camera is equipped with a 20-megapixel Sony IMX376 sensor. It is an F / 1.75 ultra-sensor sensor. Xiaomi 6x (MEA2) battery is 3010 mAh and supports QuickCare 3.0. The Mi 6X / Mi A2 connectivity features include 4G LTE, Dual-Band Wi-Fi A / B / G / N / AC, Wi-Fi Direct, Mirakast, Bluetooth 5.0, IR AMT and USB Type C port. Accelerometer, ambient light sensor, gyroscope and proximity sensor are part of this handset.